Municipal Government: Albert Lea, Minnesota (City Police Force, 4 years); 19?? to 192? 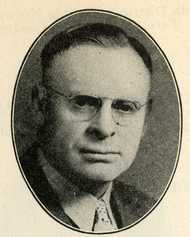 He moved to Geneva, Freeborn County, Minnesota in 1915 or 1918. He came to Albert Lea, Minnesota in 1921. He was the United States light heavyweight wrestling champion in 1918-1919 and the light heavyweight wrestling champion of the world in 1921-1922. Myre-Big Island State Park was named after him. He died after a four day illness with a rare blood disease. He was a member of Trinity Lutheran Church in Albert Lea, Minnesota. Religion provided by his memorial in the Minnesota Journal of the Senate, 1953. "It's a Fact!" Session Weekly, St. Paul: Minnesota House of Representatives Information Office, March 15, 1996, p. 20. Helmer C. Myre Memorial. Minnesota Journal of the Senate, April 8, 1953, p. 1586-1587. 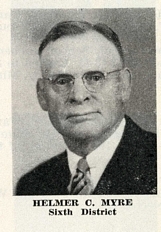 "Freeborn County - Helmer Myre." Minnesota Place Names (Electronic Resource), St. Paul, Minnesota: Minnesota Historical Society. Helmer Myre Papers - Available in the Minnesota Historical Society's Collections.